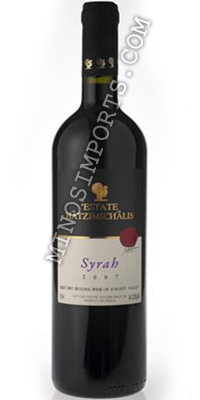 Origin: From a selected plot of the upper vineyards, part of the Hatzimichalis Estate private owned vineyard in Atalanti Valley, Central Greece. Winemaking: Fermented in temperature-controlled stainless steel vinificators. Ages for 12 months in French oak barriques. Alcohol: 13,5% Vol. Ageing Potential: Enjoy it now or within 8-10 years after harvest. Packaging: Available in bottles of 750ml, packaged in a carton of 12 or in 2 bottle gift packs. Tasting Notes: A generous, richly flavored Syrah which combines complexity and depth with grace and fineness. It’s dense nose reveal blackberry, dark plum and blueberry aromas with distinctive scents of spice and licorice. On the supple palate, black fruit flavors are enriched by a toasty oak tone while the aftertaste is warm and lingering. 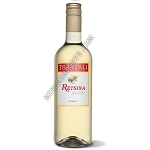 Food Pairing:Try it with juicy burgers, grilled steaks, barbequed ribs, spicy beef stew and crusty cheese. Best served at 61-64 °F.